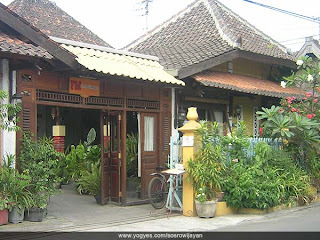 Area wisata the existing Sosrowijayan of course not seramai in the beginning of year 90-an. Enunciated only, impact increase of oil fuel ( BBM) seems to enough beating the tourism perpetrators here. In general they grip, silent of guest that is always declines recently. Like laid open [by] Suko ( 48) organizer losmen and silent hotel, the pedicab workers also a lot complains," express it when met [by] Exploring Jogja. Sosrowijayan for Suko of course menyimpan many sweet memories. At least, if seeing number of tourist visits either local and also strangers(foreigners paying a visit to Jogja around year of 90-an. That moment may be said, this area is " syurga" to all foreign turis especially which berwisata to Jogja. Because, not only losmen and hotel which able to be met easily in this area, some art shop and also café also mushroom. Not that only, for foreign turis sack;bag measure, eats drinking in Sosrowijayan also has separate situation. Besides solemn, this area also is recognized is balmy for simply taking the air and also looks for doss house. Its(the location is also very strategic, only some metre from heart Malioboro and station Tugu Jogja. But, crowded situation and hangar binger Sosrowijayan night now increasingly remains memory. The organizers losmen, hotel, café finite of pedicab worker that is formerly often then grass accompanied the guest, now fewer the numbers. For entertainment amusement world organizer and wisata, now may be said season paceklik for they. Don't know this condition will end when, what is clear they till now still optimism national tourism world and Jogjakarta especially would be normal convalesce and returned. So hotel living room capacities which average of amounts to the 30 room;chambers not melompong, like the one often seen lately.